Ahead of Macedonia’s naming referendum on September 30, the boycott proponents attempted to both use and disparage similar nationalist sentiment in the United States. A failed referendum would complicate the country’s integration into the Euro-Atlantic community for the foreseeable future. Namely, Greece is adamant the country’s name has to change to lift their veto on Macedonia’s NATO and European Union membership. The agreed name containing the word “North” is a compromise reached between the two countries on June 17, 2018 (so called Prespa Agreement). @DFRLab previously reported how some proponents of the campaign to boycott (#бојкотирам) the naming referendum used memes and hashtags made popular by a mix of the U.S. alt-right, conspiracy theorists, and supporters of U.S. President Donald Trump. The hashtags were used in an effort to gain more online support by building on existing social media engagement that generally portray Trump as a protagonist, for example #Q, #QAnon, #MAGA, #TheGreatAwakening, #FollowTheWhiteRabbit, #PatriotsFight, #WalkAway, and others. However, other boycott activists used President Trump’s statements to portray the United States as an antagonist to Macedonia’s domestic and international affairs. The dual efforts attempted to capitalize on Trump’s more populist rhetoric, while taking a stance against the United States’ policy to bolster NATO through increased defense spending. 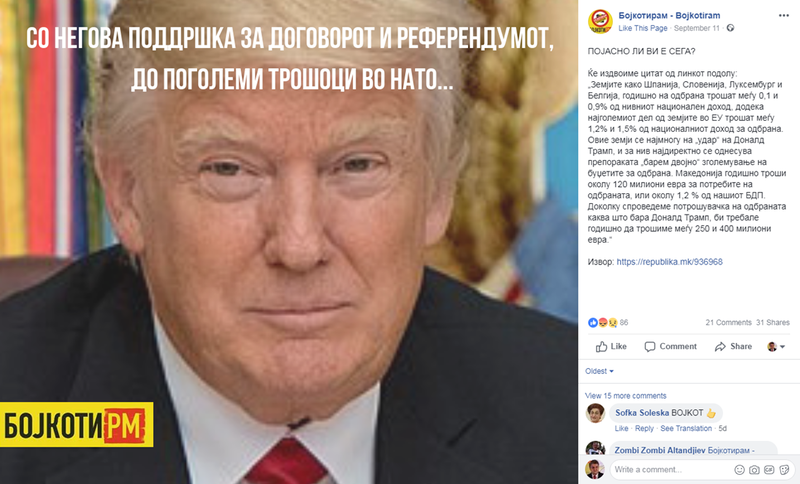 The Бојкотирам — Bojkotiram (#boycott) Facebook page, one of the most popular among such pages with almost 9,900 followers, used a statement by U.S. President Donald Trump as an argument for why Macedonians shouldn’t vote “Yes” on Sept. 30. So, unlike some #boycott campaigners who jumped on the alt-right and pro-Trump bandwagons, this instance shows a nuance or discrepancy that garnered significant online engagement compared to content shared on the same Facebook page. Further than the discrepancy between boycott supporters, the claim focused on Trump’s remarks about NATO was factually incorrect. The post claimed that if Macedonia joined NATO, it would have to spend up to 450 million EUR ($523 million US) on defense. This figure would represent 4.6 percent of the Macedonia’s GDP of $11.34 billion US (2017), an amount that no NATO member spends on defense, including the United States. Even the lower number of 250 million EUR, constituting 2.2 percent of Macedonia’s GDP would be much higher than all of European NATO allies, except Estonia (2.4 percent in 2016). Using alt-right and pro-Trump text and visual material to sway Macedonian citizens to boycott the referendum, and then disagreeing with his defense spending policy for NATO allies, highlights a discrepancy between the points advocated online by boycott supporters. One particularly interesting aspect of this case study was the way in which the boycott proponents were willing to use material in favor of, and in opposition to Trump, in order to promote their narrowly defined goal ahead of the national referendum. This shows that the boycott campaign is not necessarily ideologically bound to Trump or the alt-right, but is willing to take advantage of any opportunity they can to reach the end-goal of boycotting the referendum. @DFRLab will continue to monitor the lead-up to the referendum in Macedonia. Vladimir Petreski is Digital Forensic Research Assistant at the @DFRLab. Follow along with our #ElectionWatch coverage and for more in-depth analysis from our #DigitalSherlocks.